The XL2 Analyzer in combination with the Cinema Option forms the dedicated Cinema Meter. An interactive assistant guides the cinema engineer through dedicated measurement scripts for an intuitive management of the audio performance requirements. Cinemas may be calibrated efficiently and verified according to the SMPTE ST 202:2010 standard and RP 200:2012 recommended practice. This makes the XL2 Analyzer an indispensable tool for every cinema engineer. 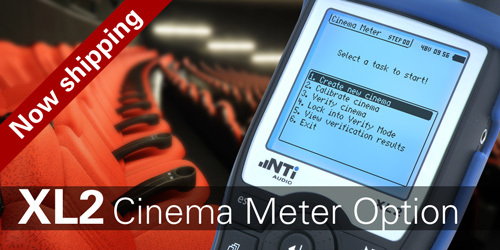 Philipp Schwizer, CEO of NTi Audio, explains the workflow of the new Cinema Meter Option.